You'll be £19.99 closer to your next £10.00 credit when you purchase Fighting With the Desert Rats. What's this? Order within the next 6 hours, 33 minutes to get your order processed the next working day! On 1 January 1938, Hugh Peter de Lancy Samwell was commissioned as a Second Lieutenant in the 7th Battalion The Argyll and Sutherland Highlanders (Princess Louise's). The battalion was shipped to Egypt in June 1942 and, as part of the famous 51st (Highland) Division, arrived in time to prepare for the Second Battle of El Alamein. In this fascinating memoir Samwell describes this and other battles the 7th Argylls were involved in throughout the war in the desert with refreshing simplicity and exciting detail. Promoted to Major, Samwell fought with the Eighth Army across Libya and into Sicily. the afterthoughts of the historians. We know this for sure because Hugh Samwell, who was wounded and awarded the Military Cross, did not live to see the end of the war. He was killed in action on 13 January 1945. Personal Experiences of an Infantry Officer during the Eighth Army's Campaign though Africa and Sicily. Hugh Samwell never saw his book in print. Major H.P Samwell was an infantry officer in the Argyll and Sutherland Highlanders during the last part of the campaign in North Africa, arriving just before the Battle of El Alamein and taking part in the advance to Tripoli, the battles in Tunisia and the post-invasion occupation of Sicily. The book was written during the Second World War, and sadly Samwell was killed early in 1945, so never had any chance to revise his work. This is a fascinating memoir, with a real freshness, providing a unusual view of the fighting in North Africa. The original memoir of an Infantry Officer who fought with the Desert Army in the Western Desert and Sicily between 1942-1943. A fine account of what war was really like for these officers. Major HP Samwell MC didn't remember beginning his walk into the battle of El Alamein. One minute he was crouched in a trench, the next walking towards the guns. It was then that he noticed that he had left his rifle behind and was armed only with his revolver and an ash walking stick. His only waste of action came when an enemy soldier who had surrendered threw a grenade at his captors, and in a blind age, Samwell seized a rifle and bayoneted him. For much of the rest of the Battle he is sitting around waiting, confused and disoriented as most soldiers are when caught up in great events. 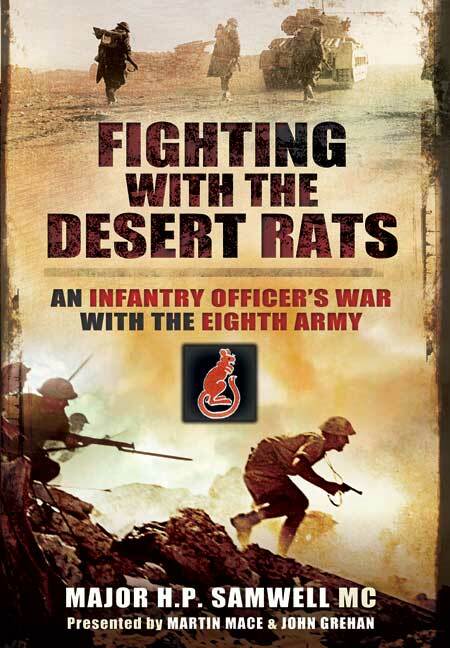 This is an exemplary first hand account of an infantry officer's experience of the Eighth Army. They are written like an expansive diary and have an urgent immediacy about them, as if they had happened only that day, which they probably had. The book ends with Samwell fighting in Sicily. He later gained an MC and was killed in January 1945, aged 33, never living to see the publication of his book. If you want to know the true reality of what battle is like, and the daily round of army life in wartime, then this is highly recommended. This is the memoir of Major Hugh Samwell MC of the 7th Argyll and Sutherland Highlanders, describing his experiences with the Battalion from its arrival in Egypt in June 1942, through to El Alamein, the advance into Tunisia and the invasion of Sicily. Any first hand account of the Second World War is valuable, but what sets this book apart from so many others is that it was written at the time, without the benefit of hindsight, historical analysis of even the certainty that the war would be won. In the preface, Samwell laments the absence of books which record the war from the perspective of the ordinary infantryman, and so he set out to document his own experiences without reference to the wider war or anything which occurred beyond the range of his vision. The result is an extremely vibrant story which may be taken to speak for any junior officer who served in the Western Desert. It is a tragedy that Major Samwell did not survive the war but was killed in January 1945, having accompanied the 51st (Highland) Division from the Normandy beaches to the German border. We can only reflect on the loss of any subsequent manuscript which he may have produced, for together, they would have accounted for so much of the British Army experience in the Western theatre. 5/5 – every Arrser should read and own this excellent book! Samwell’s memoir describes his experience of the Second Battle of El Alamein and other battle in which the 7th Argylls were involved, awarded the Military Cross, Samwell was killed in action on 13 January 1943. John Grehan has written more than 150 books and articles on military subjects, covering most periods of history. John is currently employed as the Assistant Editor of Britain at War Magazine. Martin Mace has been involved in writing and publishing military history for more than twenty years. He began his career with local history, writing a book on the Second World War anti-invasion defences and stop lines in West Sussex. In 2006 he began working on the idea for Britain at War Magazine, This publication has grown rapidly to become the best-selling military history periodical.